This Afghan kidney bean curry, known as lubya/lubia/lobia depending on how the language is transliterated, is one of our favorite meals. Since we first tasted the dish over a year ago at a local Afghan restaurant we just haven’t been able to get enough of it! 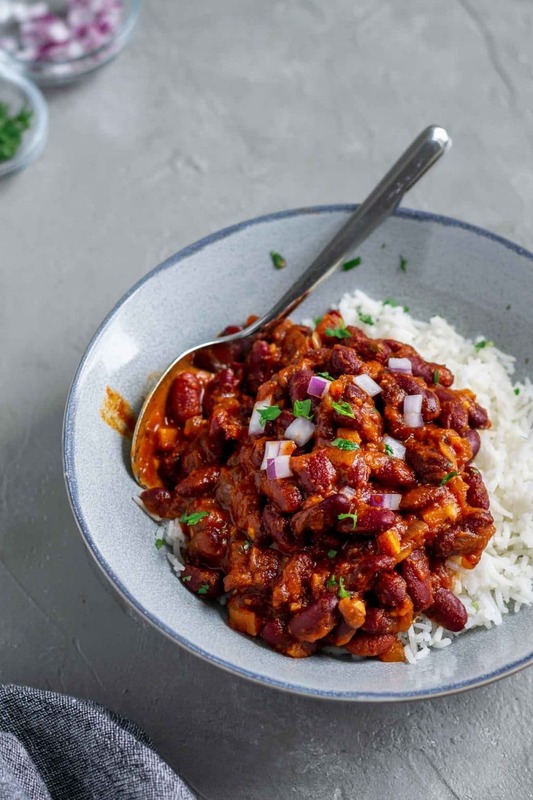 Buttery soft kidney beans are simmered in a curry base bursting with the rich flavors of coriander and tomato. Studded with lightly caramelized onion and plenty of garlic. Lubya is perfect served alongside fragrant basmati rice with a garnish of cilantro and minced red onion. Have you had Afghan cuisine before? Afghan restaurants are few and far between in the US, which is a shame as the food is SO good. The cuisine is reminiscent of the Indian-Pakistani food I grew up eating (not surprising, as Afghanistan shares a border with Pakistan), though the spices are used to a different effect. I find Afghan food to be milder than Indian food, both in amount of spices used and how hot-spicy the dishes are. 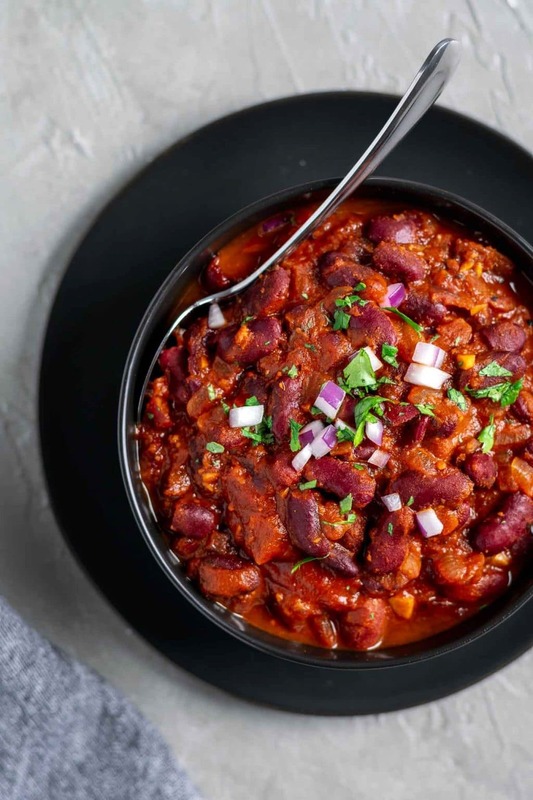 So while this kidney bean curry looks quite similar to the Indian dish rajma, you’ll find the ingredient list simpler. 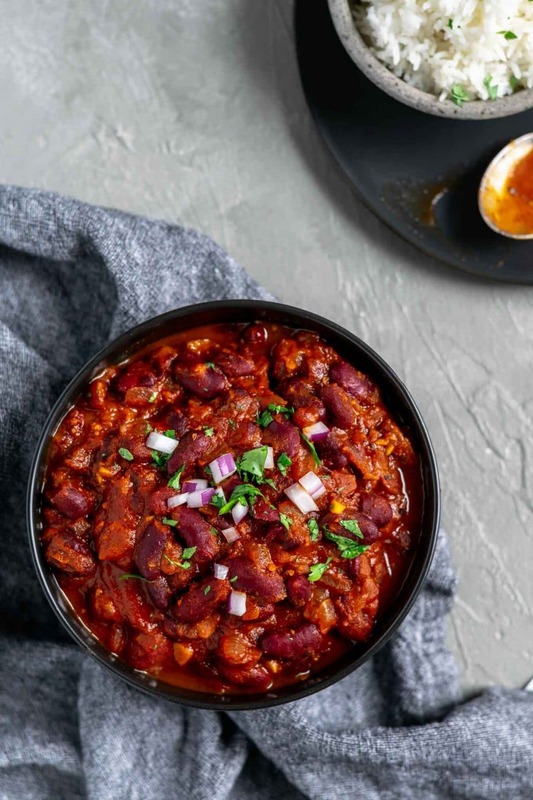 This afghan kidney bean curry is ultra flavorful, but instead of using a half dozen spices including a spice mix (typically garam masala) to achieve that, we use only three spices and let them sing. Whole cumin seed and coriander seed are essential to building the flavor of lubya. They are tempered in hot oil to bring out their best and deepest flavors, then simmered in tomatoes to make a flavorful gravy. Cumin provides the backdrop with its earthy flavor, while coriander brightens the dish with its floral and sweet tasting notes. We also add some dried mint, not enough to overpower the dish or even cause it to taste minty, but it adds a bit of extra freshness to the curry. The spiced tomato sauce is blended to a smooth consistency, an extra step which creates the creamy consistency of the gravy and blends the spices smooth. Personally, I’m not a fan of biting into crunchy whole coriander. Blending also makes the sauce a beautiful bright red-orange color. After the tomato gravy is made, the onions and garlic and sautéed until soft and lightly caramelized. This sweetens the onions, which complements and enhances the savory flavors of the curry. 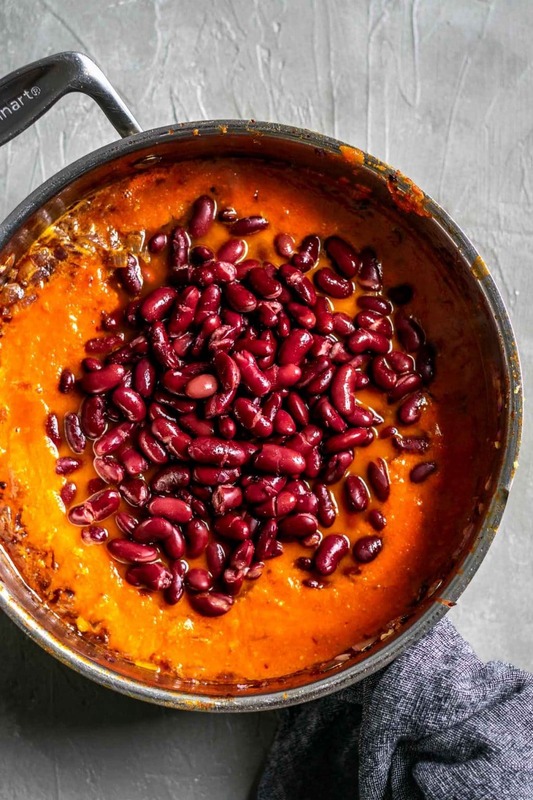 Once caramelized, we add back the tomato gravy, throw in the cooked kidney beans and season with salt and pepper and let everything simmer for the flavors to meld. One of my favorite things I’ve picked up on in Afghan cuisine is the way black pepper is used. At least at the restaurants I’ve eaten at and the recipes I’ve come across in my research, hot chili peppers are not used in the same abundance they are in Indian cuisine. Instead, freshly ground black pepper is added in generous portions for a delicious peppery flavor that builds as you eat the dish. For pepper-lovers like my dad, this is a huge disappointment, and you may find them sneaking in raw chiles to add at the table, munching on the pepper as they eat the curry (what, that doesn’t happen in your family?). But I appreciate the differences between Afghan and Indian cuisine, and am a huge black pepper fan. If you must add chiles, well you can always fry some up alongside the garlic. One thing you might notice in my Indian and Afghan recipes is that I like to cook with coconut oil. It adds extra depth of flavor to the dishes that you might miss when you don’t cook with ghee. That being said, it’s fine to use whatever canola or vegetable oil you’d like. This Afghan kidney bean curry comes together relatively quickly and super easily. It’s super healthy and flavorful, and so satisfying to eat. It’s delicious served with basmati rice and a side of vegetable (such as roasted cauliflower). But even better, make some Afghan leek stuffed flatbread (leek bolani) to go alongside it (in which case, you might as well also make Afghan chutneys)! It’s a match made in heaven. I hope to add more Afghan-inspired recipes in time, it’s a little bit of a ode to my Afghan heritage. Some of my dad’s family is descended from the Durrani Tribe, and that’s about all I know about it. But it’s a great excuse to explore the cuisine! You’re welcome, belly. This was one of the first recipes I published to The Curious Chickpea, and we make this dish so frequently that I thought it worth an update with new photos! Hope you enjoy! 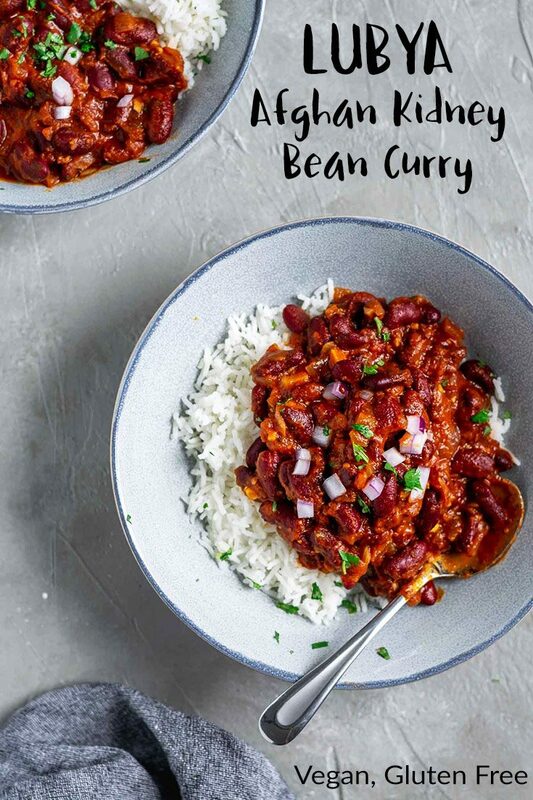 Let me know if you make this Afghan kidney bean curry! Leave a comment below if you do, and feel free to rate the recipe. Don’t forget to tag your recreations @thecuriouschickpea and #thecuriouschickpea on Instagram! I love seeing your photos! This delicious Afghan kidney bean curry is made with a spiced tomato gravy and sweet caramelized onions. It's quick and easy to make and so flavorful! Melt 1 tablespoon of oil in a heavy bottomed pot over medium-low heat. Add the coriander and cumin and cook for about a minute or until the aromatic and a shade darker. Keep a close eye on them so they don't burn. Add the dried mint and the tomatoes and their juices to the pot (watch for splattering! ), and mash them a little. Cook over medium-low heat, stirring occasionally, for around 7 minutes until they break down and are saucy. Transfer to a blender and blend until smooth, making sure to vent. Heat the remaining 1 tablespoon of oil to the pot and melt over medium-low heat. Add the onion and cook for 5 minutes, stirring occasionally, until softened and starting to turn golden. Then add the minced garlic, and continue cooking for an additional 5 minutes, stirring often so it doesn't burn. Once the onions are nice and caramelized add the broth, the spiced tomato sauce, kidney beans, salt and pepper. Simmer uncovered on low heat for about 15 minutes. Adjust seasonings to taste. Garnish with cilantro (if desired) and minced red onion and serve with basmati rice. Hi, when you say whole corriander, do you mean seeds? Yes, I do mean the whole coriander seeds. I’ll update the recipe to make it more clear! This looks super tasty! As a student o often add more vetables to dishes like this to make them go further and help get in my 5 a day. Are there any you would recommend may go with this? Maybe green lentils would work as well? Hi Kim, I would probably add some spinach (it would just melt away into the dish) or cauliflower. I’m not sure if you’re asking about replacing the kidney beans with lentils or just adding some lentils? If the latter you could but for any of these changes (except maybe the spinach) you will want to add more spices. I do not use ghee because I am vegan and so do not use animal products. Coconut tastes great with Indian and Arab flavors and has a more similar mouthfeel to ghee than just using a vegetable oil, or you can use a refined coconut oil for a neutral flavor. I made this last night. My carnivorous husband loved it, and so did I! I used fire roasted diced tomatoes but otherwise didn’t deviate from the recipe. Adding this to my regular rotation. 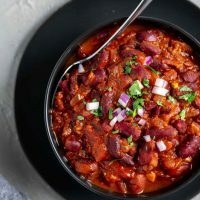 I love kidney beans and was looking for a recipe where they were the star.